Pakistan Navy ship ASLAT Visit Saint Petersburg along with Z9EC Helicopter to participate in overseas deployment to Mediterranean and European regions. Guided Missile Frigate ASLAT has earlier visited Port Aqaba (Jordan), Algiers (Algeria) and Portsmouth (UK). History is created as this is first ever Pakistan Navy ship ASLAT visit Saint Petersburg, enters Baltic Sea since independence. According to the press release by Directorate of Public Relations of Pakistan Navy this milestone is of strategic significance for Pakistan and Russia. PNS ASLAT is warmly welcomed by Ambassador of Pakistan, Defence Attaché (Pakistan), Deputy Head of Leningrad Naval Base, Department of Western Military District, Head of International Military Cooperation, and Liaison Officer from Leningrad Naval Base along with Russian Federation Navy Officers. Welcome tunes were played by Russian Federation Navy band present on the jetty. Pakistan Navy ship ASLAT visit Saint Petersburg event was attended by Reps of local Russian and Pakistani media and news channels. A short media interaction with Mission Commander, Ambassador of Pakistan and Commanding Officer was also held onboard. PNS ASLAT arrived after receiving formal invitation from Russian Federation Naval Commander-in-Chief for participation in Navy Day Celebrations of Russian Navy at Saint Petersburg. This is certainly a huge honor for Pakistan Navy as a part of Pakistan’s strategic significance that PNS ASLAT is the sole foreign navy warship which is participating in Russian Navy Day Parade. President of Russian Federation, Vladimir Putin, also graced that occasion as chief guest. Vice Admiral Kaleem Shaukat, Vice Chief of Naval Staff, represented Pakistan Navy at Navy Day Parade along with Commodore Muhammad Faisal Abbasi, Mission Commander onboard PNS ASLAT. During three days Port Call, PN delegation headed by Commodore Muhammad Faisal Abbasi held meetings with Vice Governor Saint Petersburg and Commander Leningrad Naval Base. Moreover, Cross-Ship visits were also conducted with RFN which helped in enhancing mutual understanding. PNS ASLAT was also opened for Russian citizens for strengthening people to people contact. 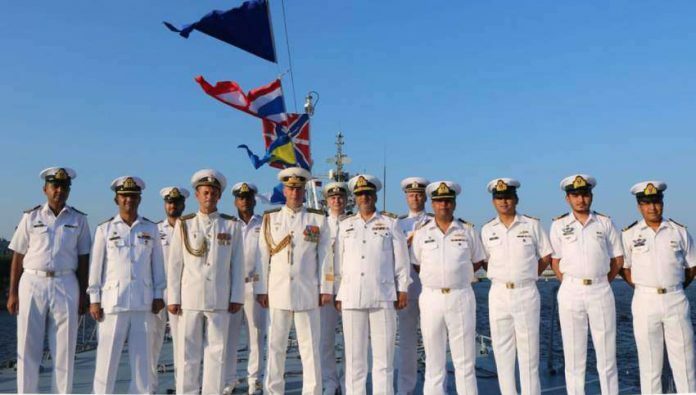 PNS ASLAT port call to Saint Petersburg in strengthening bilateral relations between both nations ‘naval forces. Pakistan Navy maiden deployment to Baltic Sea re-affirms government of Pakistan determination to promote bilateral ties and defence cooperation with friendly regional and extra-regional countries.